Do not submit here! This project is permanently closed to submissions (April 2017). We provide the following information as an archive. 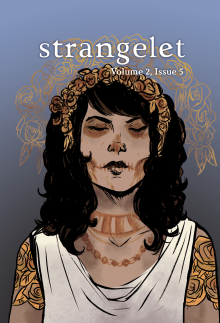 Strangelet is where literature and genre collide. We are strange literature, stories that situate the gravity of living amid the high energy of imagination to find compelling, beautiful, universal truths that speak to us from starships, from dragons’ mouths, from an everyday world tinged with miracles. EElectronic Publication Electronic Publication Published 5 x per year. PPrint Publication Print Publication Published 5 x per year. FFantasy Fantasy Open to all/most Subgenres, including: Magic Realism. NGraphic Narrative Graphic Narrative No page limits known. SSemi-pro payment (US$10-49 per piece) Semi-pro payment (US$10-49 per piece).